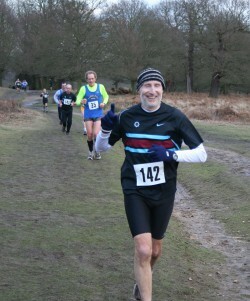 John is enjoying his cross-country event—one of many club races. © Courtesy of Blackheath and Bromley HarriersJohn E. Turner loves long-distance running. However, he doesn’t just complete the challenging 26.2-mile marathon. John E. Turner loves long-distance running. 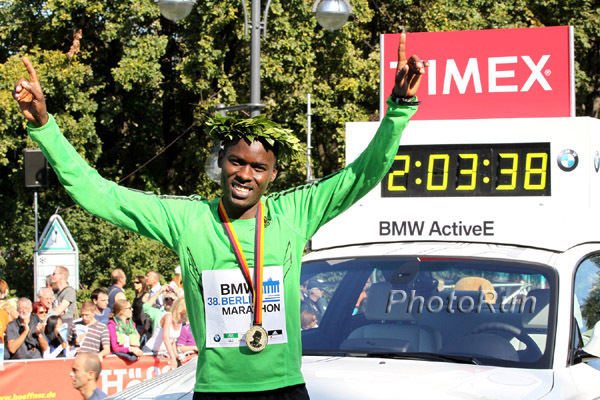 However, he doesn’t just complete the challenging 26.2-mile marathon. He runs much farther than that: John is an ultra marathoner. At the age of 60, Turner—who distinguishes himself in his England’s Blackheath and Bromley Harriers running club using his middle initial to avoid confusing himself with another runner of the same name—has found that the longer he races, the better he runs. 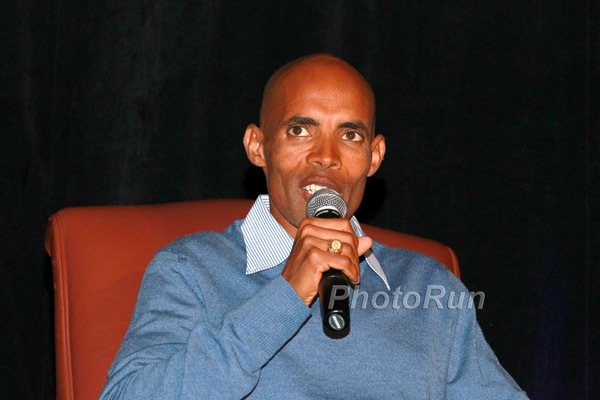 He is a very special mature runner who owns an impressive 2:52 hours marathon PR that he set when he was 40 years old at the 1991 London Marathon. However, more impressive than John’s marathon speed, is his ability to take on the ultra marathon. He’s run the grueling Comrades Marathon in South Africa and has completed four 24-hour track races in London. His record for 24 hours: an astonishing 116 miles! 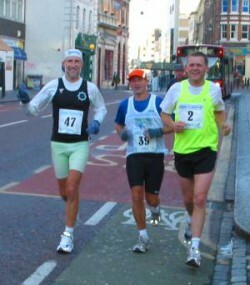 John has also completed 17 consecutive “London-to-Brighton” road races. (The London-to-Brighton is a now-discontinued 55-mile ultra marathon in England.) Amazingly, John has never suffered a running injury and claims to “do the minimum” preparation for his races. Standing six feet tall [1.84m] and possessing a lean, sinewy physique, John has been competing as a runner for three decades, and enjoys a long walk when he’s not capable of donning his running shoes. He is married to Marion, she goes by “Maz,” and shares the same birthday as her. Maz, whose parents originally came from Mainz, Germany, but was born in the U.K., is also a runner. In December, I paid them a visit to their South London home. At the time we spoke, Britain’s unpredictable winter weather had brought unexpected snowfalls, keeping John off the icy pavement for a week. He was very eager to get back out on the roads! How did you start running beyond the marathon? For many of us, running a marathon is hard enough? John Turner: I was running marathons and someone said to me, “I think this could really be your thing—running long—and you’re stamina-based.” So I said, “What else is there? Because with the marathon, you think, there is a line and there is nothing beyond it.” But someone said, “There is a race, the South London Harriers 30 [miles].” And I did that, did well, and went from there. I was about 35 then; I didn’t start running seriously till I was 32. Were you fit before you decided to become a runner? John: Yes, I ran a little at school, but then for 18 years I didn’t. I had the odd game of football and cricket but did lots of long walks at the weekend, walked to work and back. (John spent 26 years of his life as a librarian for the local council and then dedicated 10 years working in their housing division.) Yes, I did loads of walking. Do you think walking has been a big factor in your fitness? John: It still is because I don’t train a lot. I think, it’s important to walk every day. I don’t drive, never learned, so I walked. Is running a marathon relatively easy for you because you’ve run twice that distance in a race? John: Once you go beyond it, you do find that the marathons become more of a long run, but they can catch you out, so you have to respect the distance. You go to the start line, knowing you’ve run twice the distance and some people on the line haven’t, so it does become part of your mindset. Have you had injuries from doing these ultra races? John: No. I haven’t. I’ve been very lucky, though I do train lightly and I haven’t had a running-related injury in 28 years of running and racing. I turned 60 in June and before that I ran an hour on Tuesday, the same on Wednesday, and again on Thursday and then two hours on Sunday. But since I turned 60, I don’t run Tuesdays so it’s now about four hours a week. That’s all I do. I’ve always loved fartleks [a speed workout with a less structured form of alternating fast and slow intervals on the road or on a trail]. I always do bursts of speed, so as I do minimal training, as I call it, against people at the club who were doing twice that amount and getting injured. 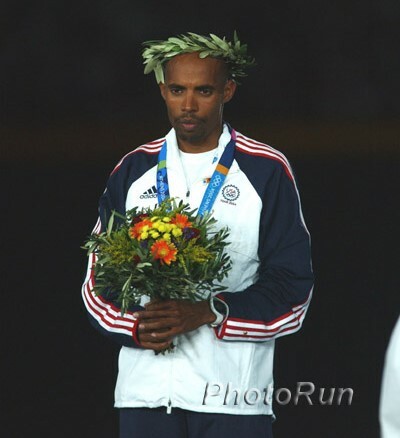 I always made a point of doing quality—strong running—and knew what I was going to do in each running session. How do you refuel yourself during a Comrades Marathon, a London-to-Brighton, or a 24-hour track race? John: I’ve always been pleased with what I’ve achieved in any of these events, but eating and drinking during them has always been my downfall. So I’ve always eaten a lot the night before: three large platefuls of pasta, pudding, and salad, but I’ve done the races on very little food. People have told me, “You must eat this and that.” But I just couldn’t, so I just had water. Now I’m 60. I’m gradually finding I can eat and drink; so I might go back to trying it. Have you had bad experiences in your career? Your household is very much a “running household.” How did Marion or Maz, as she likes to be known, get into running? John: She always used to support me and come with the children, but we went to the Southwark 5-mile race in South London and she saw some of the slower women coming in and she said, “I could have beaten them.” I said, “Of course you could, but you’ve never been interested before.” So she entered a race and never looked back. She’s done 13 marathons and her best is 4:01 [hours], she’s tried to break it many times but it remains 4:01. She started not long after I did, so she’s been running since the early 1980s and has also trained people. I presume you support each other? John: We do and both our daughters ran as teenagers and now they’re in their 30s and have family, but I hope they’ll get back to it later. We all used to go to races and they’d do the children’s races. I know you’ve done the Comrades Marathon in South Africa, but you and your wife have another African connection and that is with Nigeria. How did that come about? John: We were both working for the local council at the time and a colleague of my wife was returning to Nigeria for her parents’ golden wedding anniversary. My wife said, “How fabulous that would be for her.” And the next day the colleague came into work and said, “You and John could come as well if you like.” We flew to Lagos and we travelled from there to a small place in the bush. It wasn’t a built-up place at all. People were saying, “Don’t go. It’s dangerous.” And it was in a way, because there were police and roadblocks. But it was also great. We asked, “Can we still run?” One of the sons said, “I like to keep fit and I’ll run with you.” But people will look at you strangely because, for one, you’re white and two, because you’re running for no purpose. We became friendly and kept in touch and it’s now eight years since we met. He’s at university in the east of Nigeria, studying micro-biology and we are lucky enough to be able to fund him in part for his accommodation and college work. You have run the Comrades twice—an ultra marathon of just over 86K, which is run up from Durban to Pietermaritzburg and then down in alternate years. In 2005, you ran the “downhill” course, finishing in the bronze medal category with a time of 10:26 hours. Three years later, you ran “uphill” in 11:10:33. How did you come to run the Comrades? John: I’d done the London-to-Brighton 17 times before it ended and everyone said, “The other race in the world which is comparable is the Comrades in South Africa; you must do it.” I went with one friend in 2005, and then four of us were interested and so we did that in 2008. Your results are very creditable because when you ran the “up” version in 2008, you finished just outside the first 6,000 and you had over 2,000 behind you before the cut-off time of 12 hours. Can you describe how tough a double marathon such as the Comrades is? John: You read books; and I like to have certain mantras that mean something to me to keep me going. People who had done it gave me advice and they usually said, “Only worry about the mile you’re on.” You know when you go to the start that it’s 56 miles, but when you get going, you’re only on the step you’re on. Things like that keep you going. There’s another mantra I like, “Concentrated Calm.” I read about this idea and it fits perfectly with my stride. I find it takes me about five strides to say this to myself, “con-cen-trated-calm.” It ties in with my other idea of “Concentrate on the mile you’re on” which was given to me by a fellow club mate, Lew Piper, a famous Blackheath and Bromley Harrier who won the first London to Brighton. There must have been some tough moments. What, apart from your mantras, did you use to keep going? John: You always have bad patches and they can be early, they can be later on. You have just got to know that you will come out of it. You can have a walk break, which is perfectly fine. It’s a running race, but everybody needs to do that in such cases. But the thing that saw me through Comrades was beer. [We both laugh.] Unlike “London-to-Brighton” where there is nobody on the roadside and only 50-odd runners in it, in Comrades there can be 14,000 [participants], and it’s a party the whole day with people lining the route. I was running, thinking I’d had enough and I saw this guy by the road with a beer. I ran over and said, “Could I have a sip?” And he replied, “Have the bottle, mate.” I ran along, drinking the bottle of beer and spectators called out, “That’s the way to run Comrades!” The alcohol and the sugars in the beer gave me a buzz and I got back into it. That was at about 45 miles. It’s different for different people. My friend Peter really wanted an apple! In South Africa, ultra marathons are the thing. They don’t consider you a runner if you “just” run a marathon. They will do anything for you if you are running Comrades. I was told, that if you wanted a horseradish sandwich and told someone along the route, a couple of miles later there’d be one waiting for you. Can you compare an ultra on the road with doing an ultra on the track and say which is tougher? John: Everyone thinks you’re totally batty if you do more than a couple of hours on the track—but to be honest, I just switch off. I know what I’m trying to do. Obviously, it’s nice to go somewhere because you can see different things, but I normally just focus and go round; I’m quite happy. All runners seem to have days when they don’t feel like getting out the door to train. What do you do on those days? John: I’ve always been a very lazy person although I’m very active and I think that’s why I avoided injuries because I don’t do much but when I do it, I do it. I would say that if it’s a terrible day, I don’t do it, that’s why I always arrange to run with someone, and there are only a couple of days in the year when I run on my own. I do like to arrange to meet because I’ll never let anyone down, I’ll always turn up and that’s how I manage it. You don’t play any mind games to persuade yourself? John: No. If I miss training, I miss training. I try always to do what I want before a particular race, but I just might leave it to another day. I think you must have very good genes. Give me an idea of how active your late parents were. John: My father lived in London and my mother came from Bath in Somerset, over 100 miles away, so he would cycle down and cycle back over the weekend during the seven years they were dating. They played loads of tennis. He liked to run and walk—always did lots of walking, sometimes with the dogs. My father was still walking many miles a day in his 90s. He died just before he turned 93 and in his 90s, [he] did a sponsored 5-mile walk. My mother lived to 97 and also tried to stay active. Did being active help their attitude towards life? John: I think it did. I think if you can keep interested: they were always interested in everybody and everywhere. If you get up each day and think, what am I going to learn today that helped them? Many people just shut down, even when they turn 60. They stay in their house, don’t go out—and you close down mentally and physically. Are there any food treats you give yourself, perhaps as a reward for a good performance? John: I love all food. About the only thing I don’t like are oysters and I haven’t tried them many times. So, I like everything. I do love steak. I always treat myself to a fairly rare steak. I also like to have a lot of salad, have salad right through the year including the winter, and think that keeps me hydrated. Basically, I love eating everything. You mention your parents being active into their 90s. Can you imagine a time when you would not want or be able to run? John: No, I can’t. I hope I don’t find that day. I would really love to be running at 80+, doing just what I’d like and I’d still keep walking. A couple of years ago, I had a bad knee, but it wasn’t running related. I had an infection in the knee. They said my knee was bad, it was too early to have a replacement, and I should stop running. That made me go so down, but luckily I got a second opinion and they drew off the infection using needles, which was painful, and I got straight back, slowly, building up and I’m still doing four or five marathons a year. © Copyright 2011-2019 by Take The Magic Step®. All Rights Reserved.